The second and last day of the HK$100,000 High Roller Event of the Asia Pacific Poker Tour Macau Season 9 stop at the PokerStars LIVE Macau at City of Dreams saw 30 of the 75 participants return to the tables and within the first three levels the field was already whittled down to the last two tables. 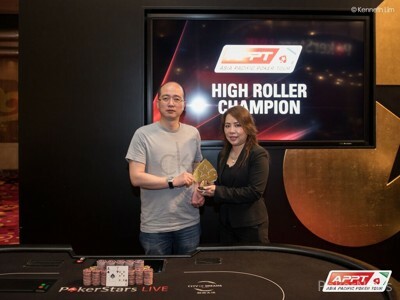 It took about seven hours of play to determine the winner, and Liang Yu emerged victorious to claim the first-place payout of HK$2,492,500 (US $321,519.14) after defeating Shunu Zang in heads-up. Among the early eliminations was PokerStars Team Pro Celina Lin, while HK$50,000 Freezeout runner-up Jack Hu cracked pocket aces to jump into the lead. 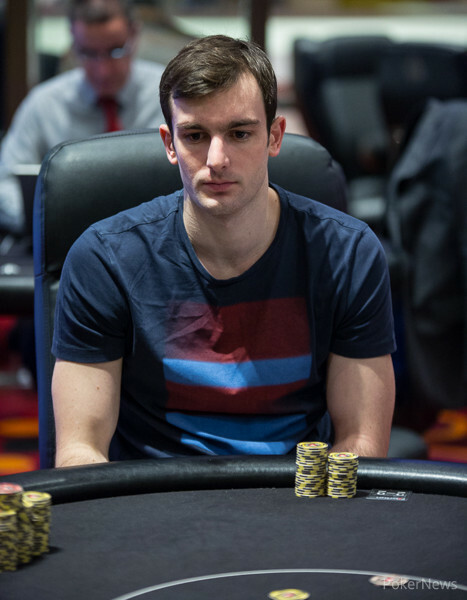 Start-of-the-day chip leader Steve O'Dwyer was left very short in a huge pot against Chang He, and later busted in a somewhat controversial slowroll by the very same player. The hot run of Shashank Rathi started with the elimination of Sunny Jung, and the player from Hong Kong proceeded to dominate the action at the tables from there on. Meanwhile, JP Kelly's bustout brought the field to the money bubble, and Japan's Hajime Haraikawa ended up being the last participant to leave the tournament area empty-handed. 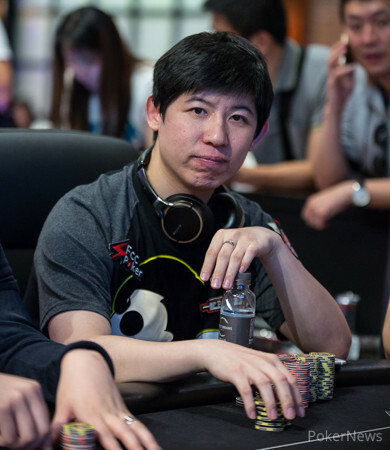 While Randy Lew of PokerStars' Team Online recovered from falling down to just over one big blind, the final table was set with the eliminations of Zhou Zhou in 11th and Asa Smith in 10th place. Rathi then sent three players in a row to the rail to reduce the field to its last six hopefuls: Yuan Zhou in ninth, Marcus Lau in eighth and aforementioned He in seventh place all sent their chips over to the local regular from Hong Kong. 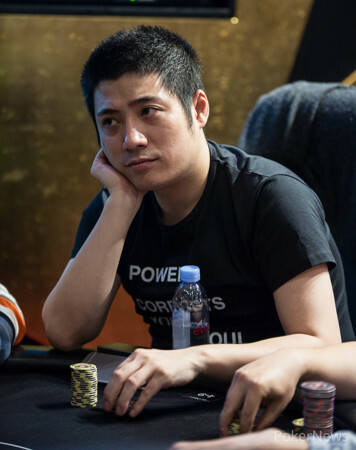 Hao Tian fell in sixth place after failing to improve with pocket nines against the pocket jacks of Zang while "nanonoko" had to settle for fifth place after a preflop all-in situation against Hu. The latter lost a big pot to Yu and was then two-outered by Rathi to miss out on the podium and finish fourth, his second final table during the festival after coming second to Sheng Sun a few days ago. 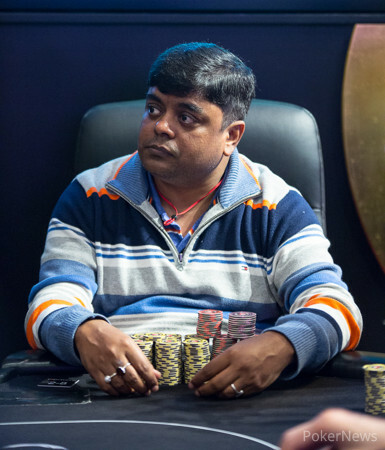 Rathi was still the by-far chip leader, but bluffed away most of the chips to Zang before losing the remaining chips against the same player, ultimately finishing in third place. A failed bluff also gave Yu the chip lead, and the tournament ended in bad-beat fashion after Yu turned a straight with the to better the of Zang. The next APPT stop takes place from July 30th through August 9th in Manila, and with that the PokerNews live reporting officially comes to an end here in Macau. I hope you enjoyed the show and will tune back in soon again! The let the rail gasp, as Yu had picked up a gutshot straight draw. Sure enough, the dealer burned and turned the turn as next card and shouts emerged as yet another possible bad beat changed things dramatically. Only a seven could have avoided Zang's elimination, but the river was a blank and the winner was crowned. No deal was made and the three-handed and heads-up action went as fast and furious as the start of the tournament during the rebuy period. Zang takes home HK$1,711,000 for his efforts and Yu will shortly lift the silver trophy and then collect HK$2,492,500. Two hands in a row went towards Liang Yu, who had started the heads-up duel by moving all in versus a min raise by Shunu Zang. Yu raised to 250,000 and was called to see a flop of that both players checked through. On the turn, Zang check-called a bet of 225,000 and then check-folded the river to a second barrel. One hand later Zang opened to 225,000 and was called by Yu to see a flop of . A continuation bet worth 250,000 and the same story repeated itself on the turn for 550,000. Yu then checked the river and Zang made the triangle sign to announce all in. Yu snap-called with the and Zang's busted flush draw with was exposed. The double up for 2.29 million chips changed the entire setup of this duel in a very short time and now Yu has a 2-1 lead. Shashank Rathi limped from the small blind for 100,000 and Shunu Zang raised to 275,000. After the three-bet to 800,000 by Rathi, Zang quickly made the triangle sign and Rathi called as quickly. The didn't help Rathi at all and the turn gave him just three additional outs with the nines except the to stay in. The dealer then burned and turned the river to give Zang a winning flush. Rathi was eliminated in 3rd place for HK$1,124,000 and Zang will start the heads-up with an overwhelming lead. Quick break before the start of the battle one-versus-one! After a three-bet pot to the flop, Shashank Rathi led for 500,000 out of the big blind and Shunu Zang called from the button to see the on the turn. Rathi jammed and received a snap-call to flip over for ace-high. Zang was already guaranteed the win with for trips queens and even got the on the river for quads. One hand later Rathi got some chips back after getting paid for 400,000 on the river and showing runner runner two pair for the winner. Liang Yu moved all in for 1,190,000 chips as first to act and Jack Hu reshoved out of the small blind with the superior stack and better hand preflop. The flop and the turn were save for Hu, but the on the river let the rail erupt. Hu was still smiling when leaving the tournament area and joked "alright, show me the money". 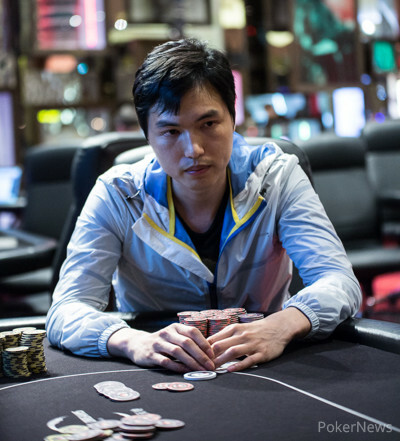 It is the second big score within a few days for Hu and he takes home just under 1 million Hong Kong Dollars. Moments into the new level, PokerStars Team Online member Randy Lew moved all in from early position for what appeared to be five big blinds and Jack Hu looked him up out of the big blind. It was not meant to be for "nanonoko", as the board ran out and the American was eliminated in 5th place for HK$782,000. Shunu Zang moved all in from early position and Hao Tian called all in for his last 730,000 from two seats over. The action folded to chip leader Shashank Rath in the big blind and he was not going for four in a row. The board didn't run out without a sweat, but ultimately stayed save for Zang with . 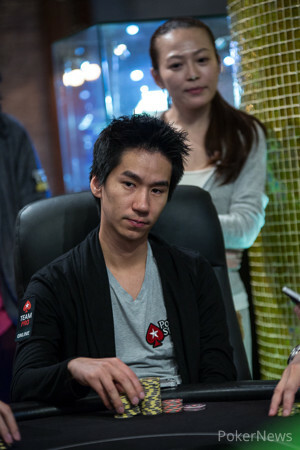 Tian collected HK$684,000 for his efforts and Zang moved into second place with around 2.4 million in chips. Who will be Crowned High Roller Champion of the APPT9 Macau?